Summer is here in full force and the birds are mostly still up in their breeding territories, so in addition to my trips in Cupsogue I've been making some little "clean up" trips for birds that I can still see. On Thursday I did a short drive up to Bedford in Westchester, to the Mianus River Gorge. Tom Burke had reported 8 (!) Barred Owls there, and I was happy to hear about such an accesible way to see them, especially after missing them in the Adirondacks. The area on the way up is full of VBGs (Very Big Houses) - one of those super-wealthy enclaves tucked away above the city. I half expected to get pulled over for breathing the air up there, but it was quiet as I pulled up to Mianus. The Gorge is a private preserve, only open from 8:30 am to 5 pm, but the owls have been active during the day, and so I got there around 10am. I hiked about a quarter mile into the woods, feeling like I could easily miss an owl in the dense pine and deciduous mix that lines the river. I was looking at tree trunks as well for any whitewash, when I caught a little movement and saw a big bird fly over the trees and perch a little ways off. I called to it a couple of times, without any luck. I stood there hoping something would happen, when I heard a "hoo, hoo" above me...I looked up and there was an adult Barred Owl checking me out not thirty feet away. It seemed huge, and with its all-black eyes it was an intimidating presence. 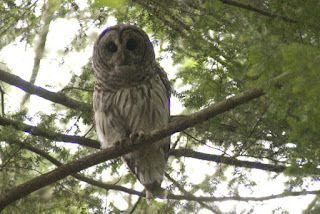 I got some photos despite the very dim light, and as I was I heard a screeching behind me, which turned out to be a first-year Barred Owl perched nearby. In contrast to the adult, the first year still had down in its plumage, and a fluffier stuffed-animal appearance. It called continuously for several minutes, perhaps hoping for some food from the adult. All told I spent about an hour there before heading back to the city. 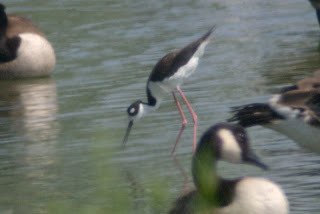 Today (Saturday), I got a call at 7:30am from Shane Blodgett...Black Necked Stilt at Jamaica Bay! I'd chased Stilt twice this year, and this was probably my last best chance. I had a previous commitment until about 9:30, but by 10 or so I was at the West Pond at Jamaica. At first the bird was not apparent, but after a few minutes I took another scan of a large flock of geese and there it was. Even though Stilt are impossibly long-legged, they are still much smaller than a Canada Goose, so this one had probably been blocked by its larger, less elegant avian brethren. We got fairly close and I got some shots through my scope, which were still a little fuzzy due to the heat haze. I joined Sy Schiff and when we were done looking at the Stilt we checked the East Pond as well, but aside from a lot of Mute Swans (a couple of hundred, probably), and spotted sandpiper, there wasn't much else to see. In a week or two this spot should start to heat up with "fall" migration shorebirds (yes, it's July, but the early bird gets the fall migration, I guess)...meanwhile, the Stilt was a nice bird to tide us over until then. 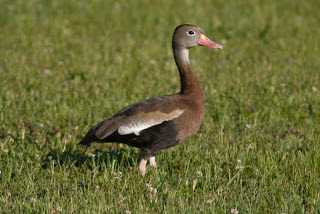 Friday morning I was checking my emails when I saw that a Black Bellied Whistling Duck had been reported in Broadalbin, about and hour north of Albany. I grabbed my bag and started driving...I was in Broadalbin at about 12pm. For the next three hours I worked the lake by Broadalbin, looking for a spot to see the water, and trying to scope as much territory as I could. I've said it before, but trying to find a bird on a lake that has been almost entirely privatized (even the local park was for "residents only"!) can be very frustrating...the phrase "property is theft" somehow keeps running through my mind. Marxist ideology aside, I did my best but didn't have any luck, and drove home. I got into Brooklyn around 8pm. Just as I pulled up to my house I checked my email...a revised post showed that the duck was not in fact on the lake, but in a pond about a mile away. I'd scheduled the next two days for Cupsogue to look for Arctic Tern and pelagics, but I really wanted to see the duck, too. After a little hemming and hawing I set my alarm, and at 3:30 the next morning we were out the door and headed back for Broadalbin. By 7:30 we were at the pond watching it eating with a flock of Canadian Geese. 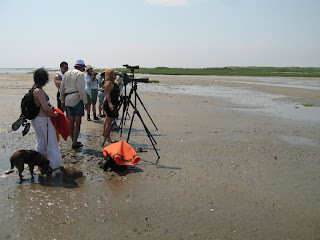 I took some photos, and we turned towards Cupsogue. 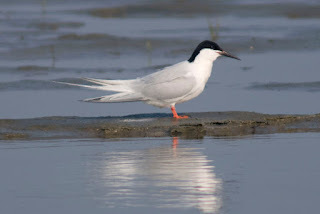 By 2pm I was on the flats with Shai Mitra, who found not one but two Artic Terns. We had a great time studying them for a couple of hours, and then went on to seawatch where about a dozen of us saw Manx, Coreys and Greater Shearwaters. It was the longest day of the year, and we used the it to the fullest. 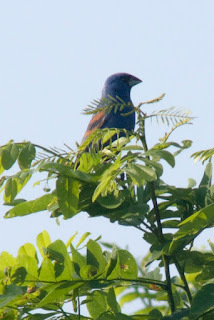 We stayed at a "cheap" hotel in Riverhead (cheap is relative in the summer in the Hamptons), and I got up early the next morning to try for the third time for Blue Grosbeak at Calverton. Third time (and some good direction from Tom Burke and Shai) was the charm. 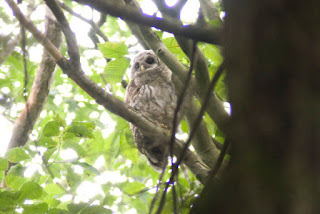 It took about and hour and a half, but I finally heard a faint call, and as I got closer saw it was the bird. I was able to get some recognizable photos, and then walked out of the brushy habitat and picked a half dozen ticks off my pants and rubber boots (this is one of the ticky-est spots I've ever seen...Monkey had gone into the brush for about 5 seconds on the previous trip and I pull over a dozen ticks off him). We finished the weekend at Shinnecock looking for Wilson's Storm Petrel and scanning the ocean for other pelagics. We had a couple of more shearwaters (two Great and one Manx, as far as I could tell), but no Storm Petrels. It was a beautiful day, and the time passed quickly...it was mid-afternoon before we knew it, and we headed back to Brooklyn. On the way back I checked my email again...Tom Burke had seen the Black Bellied Duck in Broadalbin, and had noticed a yellow band on its leg. Turns out it was an escape from an aviary about five miles away...not a vagrant from Florida or Texas, and not countable for the year. Still, I wasn't dissapointed...we'd put the effort in for the bird, and that's really all you can do. Next time I'll check more carefully for leg bands, though. 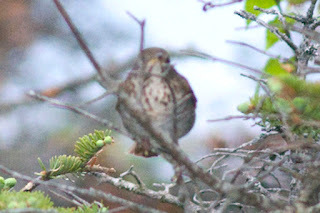 Since before I even started the big year, I had been told by several people that one of my big year requirements was going to be a pilgrimage to the mountain top: specifically, to the top of one of the several mountains in the Adirondacks where Bicknell's Thrush breeds. The time had come (Bicknell's arrive in late May/June), so I packed up the car with my girlfriend Jessica and with Monkey we headed north. I was working Friday to Sunday on a shoot, so we left Sunday afternoon and got up near Whiteface Mountain around 8:30 and checked into a motel. We ate and were asleep by 10:30, and then up at 3:15am. We were at the base of Whiteface at 3:30, and started hiking the 5 miles and 2500 foot incline we needed to cover to get to the top. We were hiking a road that you can drive, but only after 9am, and I didn't want to miss our only opportunity because we got there too late. 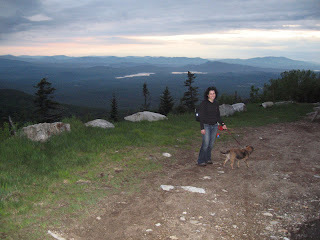 We started with headlamps, but first light hit by about 4:15, and by 4:30 we were starting to hear bird song. This is one of the tough things about birding this time of year...first light is very early, unlike in January when it's still dark at 7am. About 1.5 miles in we heard a thrush, and then another and another! I started to record, and we started to talk about getting to turn back early, when I realized that the call was not Bicknell's, but Swainsons Thrush. Chastened but undaunted, we soldiered on up the mountain. We heard many birds on the hike, but it wasn't until we were about 500 feet from the top that I finally heard the Bicknell's call. Just as I started recording, the bird flew across the road! It was perched briefly, but I managed to get a shot off with my camera. It was thrilling to see the bird as well as hear it, and we happily hiked the last leg to the top of Whiteface to enjoy a panoramic view of the Adirondacks with the mountaintop all to ourselves. 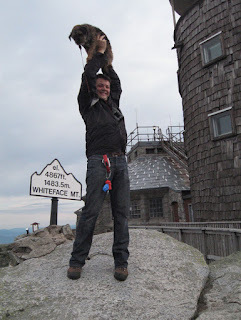 We took a minute to get a photo of Monkey, who at the time was probably the highest elevated Border Terrier in North America. On our way back down we had two Bicknells singing in same spot, and got some more recordings. We made good time back down the mountain, and were back at the hotel by 10am. We tried for several other birds on the trip, including Three Toed Woodpecker at Ferd's Bog and Spruce Grouse, but no luck. Surpisingly we didn't see a single Ruffed Grouse (which I've seen but need a photo of), nor did we hear a Barred Owl (which I've yet to see), so the Bicknell's was the only new bird for the trip. Nonetheless, I think we all felt satisfied (and tired!) on the way home. The last week I've been going out to Cupsogue, on the eastern end of Long Island. Along with several other inlets on the South Shore, Cupsogue is a great area to see terns, and also a good spot to sea watch. Sea watching, of course, is just what it sounds like...sit on a beach (preferably in an elevated spot) watch the water for birds. This time of year you might see several types of Shearwaters, Wilsons Storm Petrel, and maybe even a Jaeger. Of course there is a lot of seeing nothing, too, but you can do worse than sit on the beach and look out over the ocean these days. The flats at Cupsogue are very cool...mud flats are exposed on the bay side at low tide, and lots of shorebirds are attracted to them. 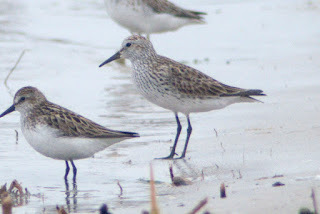 Dowitcher, Red Knot, Willet, and oth er sandpipers are common. The terns are mostly Common Terns, but every once in a while another bird seems to magically appear in the flock. 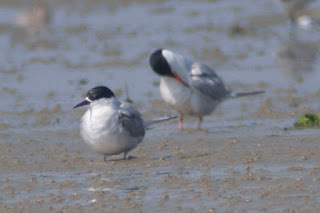 In the last week I've seen Roseate Tern, Royal Tern, and most surprisingly (and with Shai Mitra's help!) a Sandwich Tern. Arctic has also been present several days this week, but I haven't seen it yet...I'm sure a little persistance will pay off eventually with that bird. Even when there are no "special" terns around it's great to just wade around out there and photograph the birds. I was about 8 feet from a group of Short Billed Dowitchers, and had a great time taking photos. Also got photos of Salt Marsh and Seaside Sparrows, both of which are in the grassy marsh that abuts the flats. It's sunny and hot and I'm using sun tan lotion for the first time this year, and it's been really enjoyable to be at the beach and be looking at great birds. I went out to Jamaica Bay and Breezy Point today. It started off misty and rainy, and then turned into a flat, cool and hazy day. 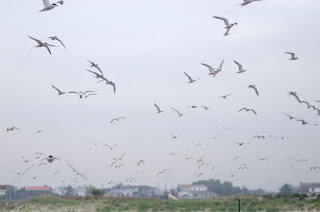 I got to Jamaica Bay around 8am on a falling tide, and there were lots of shorebirds. 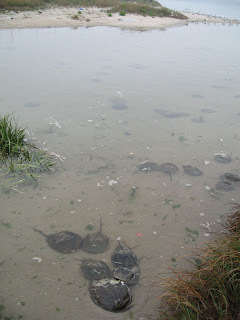 Also in the inlet at Big Egg Marsh (part of Jamaica Bay, just south of the visitor center) were hundreds of horseshoe crabs, apparently mating and laying eggs. They ranged in size from salad plate to serving platter, and as I walked along the beach I flipped over the ones that were lying helpless on their backs (if horseshoe crabs have backs). After the recent debacle with the fishery's overuse of these creatures, I figure they can use any help they get. The shorebirds were mostly Semipalmated Sandpipers, as well as Ruddy Turnstone, a few Red Knots, Sanderling, and a single White Rumped Sandpiper (a new bird for me). 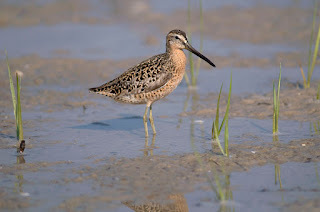 No Whimbrel, but it's really more of a fall bird--like many of the shorebirds I'm looking for now, it will be more common in the fall migration than the spring. 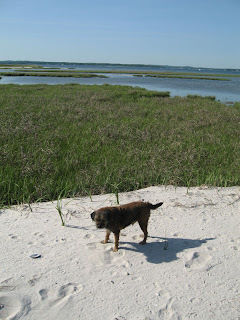 At the West Pond of Jamaica I worked over the marshes and tidal flats. The "best" birds were a Tricolor Heron, Little Blue Heron, Glossy Ibis, and (out in the open for a few seconds!) a Clapper Rail. A couple of Willow Flycatchers were calling along the path, and there were a few terns plunge diving out in the bay. I've been checking the Glossy Ibis each time I go for White Faced Ibis, but no luck so far...I'm also hoping a Sora will show itself as one did last year, but still no sign of it, either. I made a stop at Plum Beach at low tide for Black Skimmer, but just found some Least Terns and more horseshoe crabs, so I decided to go all out and hike out to Breezy Point, one of the primary breeding areas for Black Skimmer. Breezy is difficult to access: basically a private community that has co-opted an entire penninsula at the end of the barrier islands of Long Island. I parked in Fort Tilden and started the long hike west...I've never made it all the way to the point, but I figure it's at least a 45 minute hike on the beach. There were no people on the beach, but there were plenty of birds. 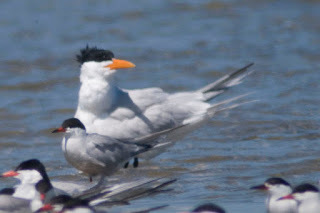 First gulls, then Common and Least Terns, and then Black Skimmer, in groups of 20 or more. 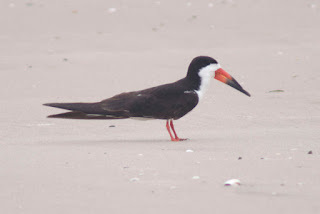 I saw about 75 of these odd birds, including one resting in classic Skimmer fashion on the sand with it's body flat and head laid out like a dog. The birds also make a kind of doglike barking call, and a few flew by noisily and then dropped down and skimmed the water with their giant orange bills. There were also lots of Sanderling, and a few Piping Plovers, a single Semipalmated Plover, and a Least Sandpiper. After walking and watching for about an hour I turned back, and headed a little closer to the dunes. 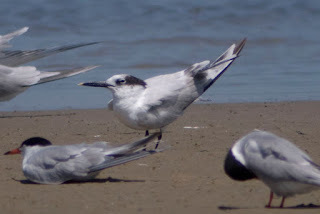 I noticed a bunch of terns on the sand there, and got a little closer. As it turns (terns) out, it was a nesting colony. When I was about 100 feet away, the entire colony of several hundred terns lifted up into the air...I had accidentally set off the alarm! They swarmed forward and one after another terns dive bombed at me, loudly sqwaking their displeasure. Not r ealizing what was in store, I took a couple of photos of the attacking birds, planning to move off momentarily. 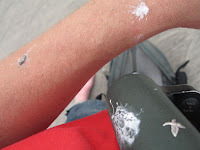 Well, the terns starting squeezing off shots of their own, and before I new it I was splattered with tern poop. I beat a retreat and assessed the damage...shirt, pants, camera, bag and binoculars were all hit. 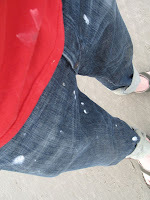 I was laughing as I waded out into the water to wash off what I could, chastised and baptised by the terns.